Did you know that driving too slowly could land you in trouble with the law? - Flexed Did you know that driving too slowly could land you in trouble with the law? Did you know that driving too slowly could land you in trouble with the law? You could be handed a fine and penalty points for ‘careless driving’! In the UK, motorists know that if they break the speed limit set on different types of roads and are caught by the police or cameras, they could be punished for the offence. But what a lot of drivers aren’t aware of, is that you could be prosecuted for driving too slowly but why? There might not be many minimum speed limits that exist throughout the country, however, there are times when driving too slowly could be classed as dangerous. Basically, driving too cautiously can be a danger on the roads and could be noted down as ‘careless driving’ by a police officer if spotted. There’s risk of an accident happening when motorists drive too slowly and could also lead to increased congestion on the roads. Driving too slowly for instance, in a tunnel, could be extremely dangerous and may lead to a catastrophe. 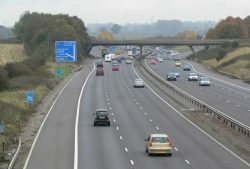 One of the worst roads to drive too slowly on is the motorway, as they are designed to enable motorists to travel from A to B safely on free-flowing and fast moving lanes. Driving too slowly on a motorway could cause other drivers to slow down when it’s not really necessary, plus there’s a risk of being rear-ended. A minimum speed limit warning consists of a blue circular sign which contains the minimum speed limit in white. The end of the minimum speed limit is marked with the same sign but has a red line through it. If caught driving too slowly you could be given just a verbal warning by an officer but if the offence is more severe, you could be prosecuted for ‘careless driving’. There are a number of different punishments handed out for ‘careless driving’, or ‘driving without due care and attention’, which includes a fine and penalty points. You could even be issued with an instant disqualification if your actions are serious enough to warrant such punishment. A fine of up to £5,000 could be issued, as there’s no set fine limit for driving without due care and attention but it’s highly unlikely a fine this high would be handed out. Anywhere from three to nine points could be issued for ‘careless driving’ or ‘driving without due care and attention’.